"We understand that switching to a new, unfamiliar, far away eastern-country lab like us can be quite risky. But all we'd like to ask from you now is not to risk, but just to TRY first. Our clients always sent the cases more and more when they got the sample from us. We have built strong trust and confidence in every customer we serve. We'll let you see that we can do all what we said we can. Quality is always #1." Our foundation is built on quality, trust, and customer service. We offer a full range of dental restorations including fixed prostheses, removable prostheses, orthodontic appliances, and CAD/CAM products. 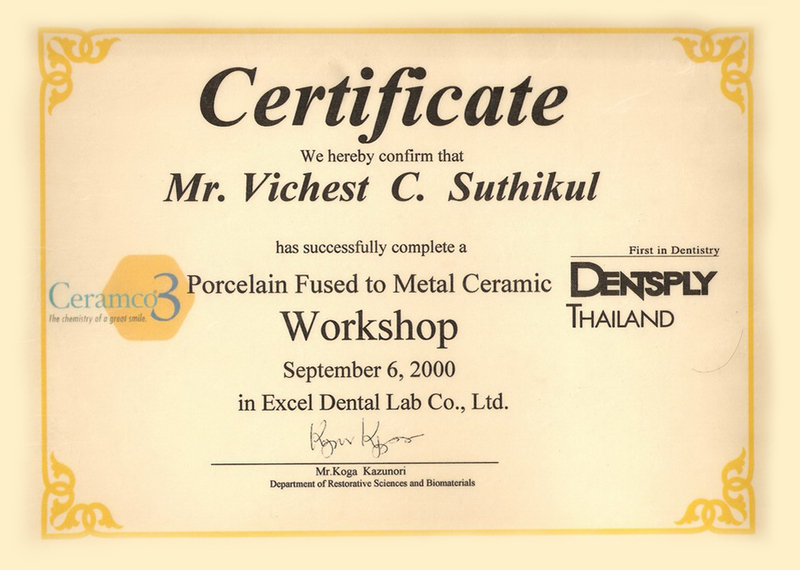 We can fabricate from the most traditional work of porcelain-metal crown to the complex ones like custom abutment, screw-retained bridge, implant bar or to the newest innovations like multi-shaded glass ceramic, monolithic anterior zirconia, and sintermetal. Our highly skilled technicians combined with world-class materials and state-of-the-art equipment will ensure exceptional quality restorations that always meet your expectations. Our lab employs a working model with pindex system (individual die) and also prepare a solid model to check final fit and contacts against. We also work with Artex split cast system. 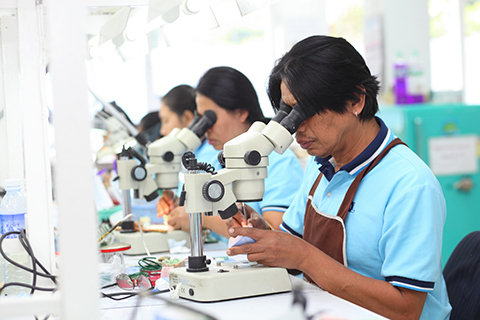 Cutting-edge 40x microscopes are also used in several departments to enhance accuracy and precision. Prior to shipping, every single case is subject to rigorous quality control measures to ensure esthetics, function, and fit. Therefore, adjustments and remakes are kept minimal. 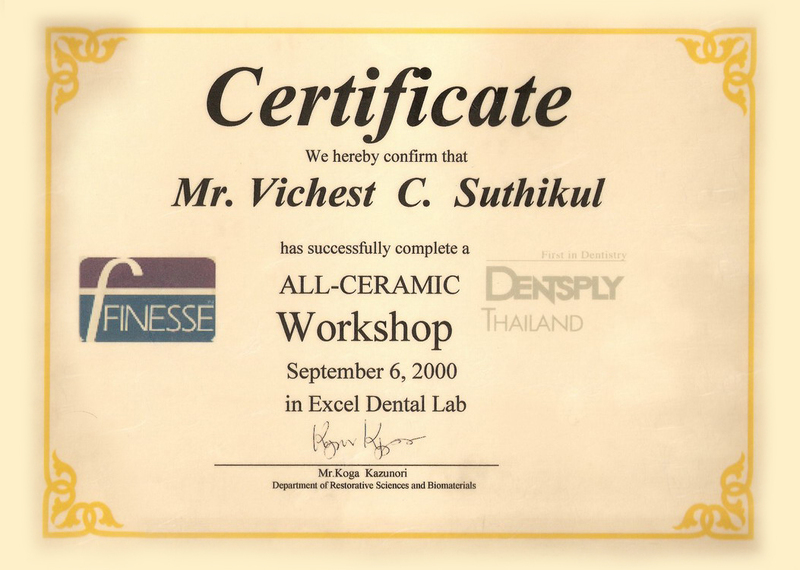 With over 30 years' experience in Prosthodontics, your complete satisfaction is guaranteed. Please also view our warranty. 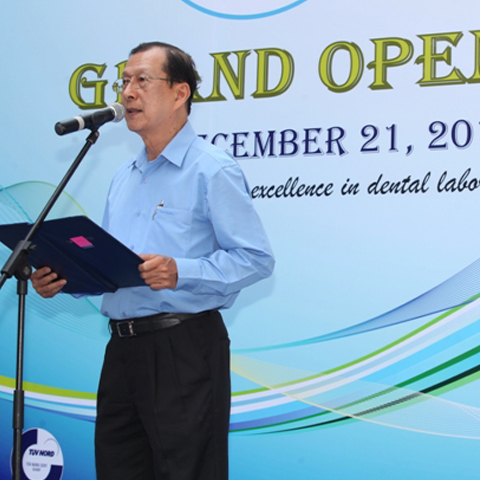 We look forward to establishing long-term cooperation with dentists, dental labs, brokers/agents and other dental practitioners from around the world. Contact us now and we will be happy to assist you in any way we can. 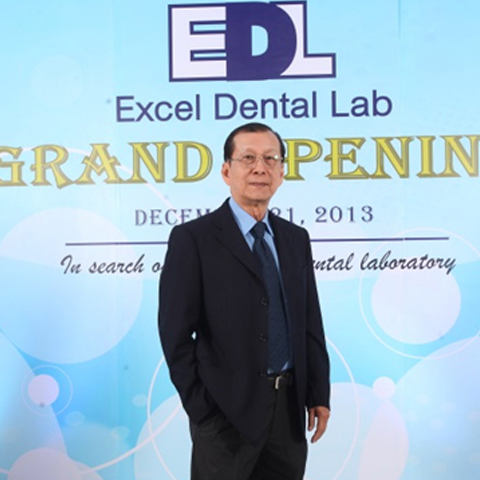 In 2014, Excel Dental Lab inaugurated the new office building in Bangkok city center, which is spacious, ultra-modern, and fully set for future business expansion. 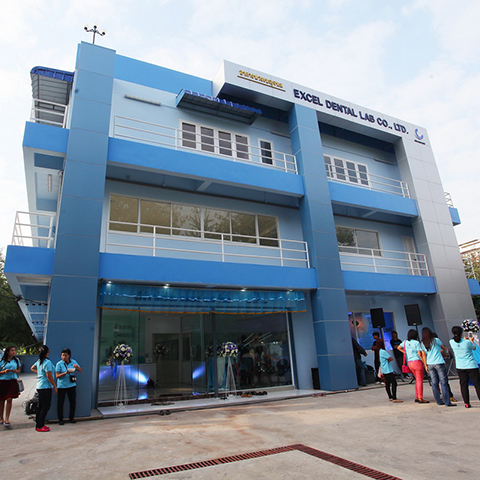 The new premise was built on the land of 1,000 sq.m., with total functional area of over 1,800 sq.m. 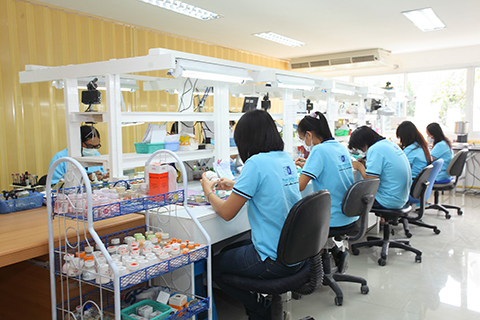 inside the 3-storey building, divided into laboratory and employee dormitory sections. Everyone is working and living together harmoniously like a family business which is our corporate core value. 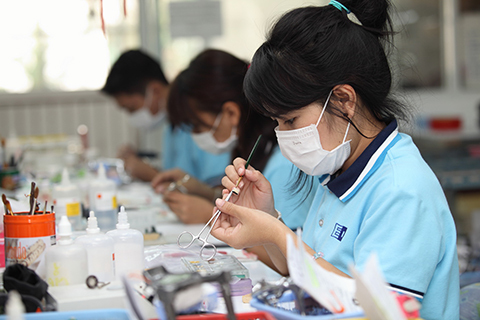 We now employ over 40 highly-skilled technicians, supported by world-class dental materials and innovative equipment. 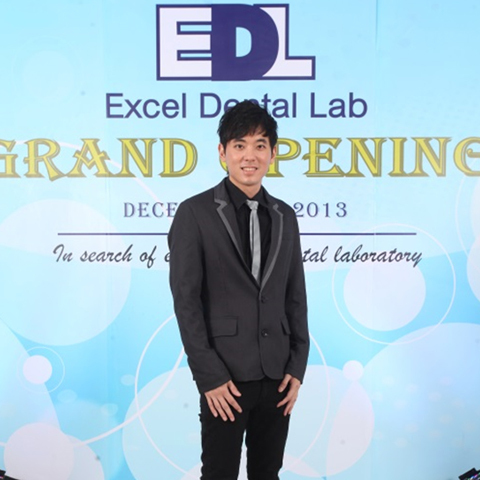 "We do not want to be only a dental lab, but we strive to become your long-term partner who you can totally rely on, and who can help you succeed in your field of work. We know exactly what you want and continue to deliver the best value consistently." 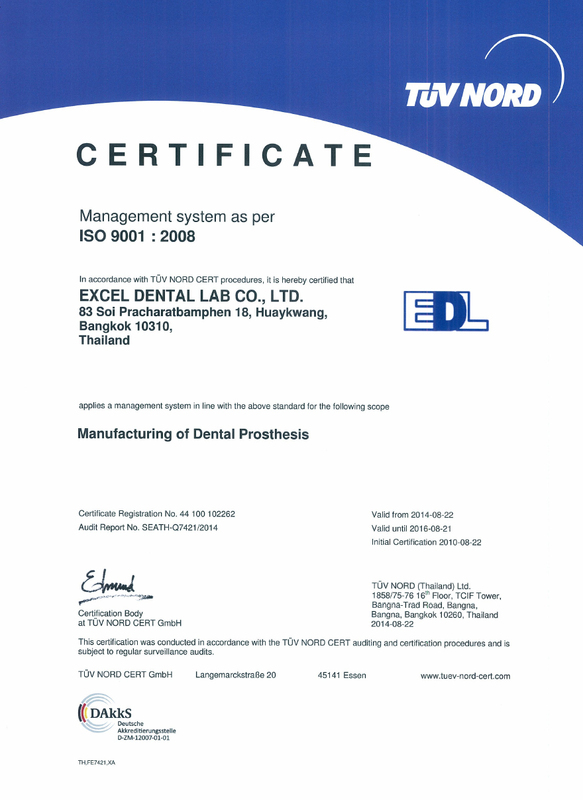 Excel Dental Lab has completed the FDA registration requirement for 2015 to legally market our prosthesis products in the U.S. View FDA confirmation letter. Being aware of today's global health & safety concerns, our company always adheres to the highest standards of materials, devices, products, manufacturing processes and working conditions as required by FDA as well as local authorities. Our company has obtained an ISO 9001:2008 certification since 2010, which signifies our relentless commitment to the highest quality management system and worldwide standards. Lot number and traceability data are kept in our records for several years. So you can be assured of our compliance with the strictest health and medical regulations in each country market. • Why outsourcing to Thailand? We just received our case back and are very pleased with the result. I am hopeful that this is your standard quality and that you are able to handle the volume of work that we intend to send to you.